I first met Brendan during the solidarity harvest and friendly lunch held at Le Briseau to help Nathalie cope with the passing of her husband Christian Chaussard. The guy was easygoing and cool and I thought I might visit him one of these days. Brendan didn't land in this corner of the Loire overnight, he is a New-Jersey native who spent most of his youth in San Francisco where his parents moved to in the 60s' to follow the hippie trail. When in San Francisco, Brendan lived through the cultural revolution embodied by this city, he soon developped a passion for music, going to concerts at the Fillmore Auditorium, listening to psychedelic bands and then much later to punk musicians. His mother being French, he travelled from time to time to France and eventually moved in Blois in 1971 at the age of 15, initially to better his French, staying with his aunt. He went to high school there and passed his baccalauréat in 1974, beginning all the while to love this country. His aunt Geneviève was a journalist at Le Figaro (a major newspaper) when he arrived in France, and Brendan remembers that one day she brought him to a restaurant and asked him what he wanted to drink, he looked at the drinks list and ordered a coke, in America it was unthinkable to order wine for a minor, and the waiter could have risked jail for letting him have some; his aunt was pretty upset of his choice, saying that this was France and he had to oder wine, and that's when he understood that there were big differences in the culture here, things that he didn't suspect and that he should try to learn. From then on he tried to understand better this alien culture and as it happened that his aunt was planning to leave Paris and journalism to set up an antiques business in Blois, and as she told him he could stay if he wanted to, he decided to remain. The Grange aux Dîmes Brendan set up his facility in the former grange aux Dîmes, that is, the tax-collection barn where farmers would give 10 % (dîme, pronounce deem in old French) of their crops to the local rulers and tax administration. This horrendous state of affairs and tax extortion lasted from maybe the 12th to the 18th century, but happily and thanks for the revolution, today we're modern and progressive, and the French people now give ungrudgingly [well, until recently] 46 % of their GDP as compuslory levies (source). The barn (grange) does a good job as a winemaking facility, storing now other kind of treasures and on a liquid form. But part of the building he uses to make his wine was also a cuverie (vat room) used by the church people before the revolution. The house and buldings around the church belong to his wife's family since more than 5 generations, so it can be said that Brendan's grafted roots are pretty deep. Sequitur on Brendan's story : Brendan came back to California in 1977 and there, he joined several music groups of the hard-core punk movement in California, as one of these groups was looking for a singer and he happened to be a good singer. It worked well and he went on stage in the first part of events featuring The Dead Kennedys, Black Flag and the Avengers to name a few. Having kept contact with a friend whom he met during his highschool years in France, he came back to France in 1980, married her and stayed in France for good. Brendan says that this punk-rock episode in the U.S. helped him understand that you can do things even though you think you haven't the training and expertise in a given field, and he says that this applies to winemaking well. Brendan quit the radio station in Blois in 2008 and he enrolled in the viticulture school in Amboise. You always have to work part time in a winery when you're in a wine school, and he spent his training part at Thierry Puzelat's négoce, taking advantage of Thierry's rigorous winemaking and vineyard management expertise. He opened shop in 2010, making wines from purchased grapes (the equivalent of 2 hectares then) and from the start he vinified the natural way, using only wild yeast and working like Thierry on reds, with semi-carbonic macerations. For the whites, Brendan got his inspiration from Philippe Tessier. While working at Puzelat's négoce he saw that you could buy grapes and make wine without actually owning vineyards or having family roots in the growing trade, so that's what he eventually did from the start, buying grape from a grower who farms organic in the Cher valley (St Julien de chedon) and who doesn't make wine himself. In the vat room While Brendan sources much of his grapes in the Cher valley, he found since last year someone in the region of Vendôme who has Pineau d'Aunis grapes to sell. Remember that here in vendôme it's pineau-d'aunis country, and Emile Hérédia's iconic pineau-d'aunis winery Domaine de Montrieux is only 7 km away. Pineau d'Aunis is a now-rare grape variety which has been sidelined in much of the Loire region by the AOC administration and its segregation rules, in spite of the deep roots of the varietal in the Loire history. The variety yields exciting wines in the hands of good winemakers and when you have tasted (and drank) one of these wines you can't but ask for more. Brendan now works with a 30-are parcel of pineau d'aunis. Brendan also has a parcel of his own, in Touraine Mesland at quite a distance from here, and he plans to plant a vineyard of Pineau d'aunis close from Sainte Anne, but this is tricky with the odd French rules, he has first to buy back the uprooting rights from the grower so that he can plant thereafter (another chapter on how to put sticks in the wheels of expanding wineries). Today, the overall vineyard surface Brendan works from is 5 hectares, a nice increase from the 2 hectares he still worked with last year. He needed to augment his production because he couldn't provide enough wine for his buyers in Japan. They buy from his different cuvées but foremost his sauvignon. Mrs Yasuko Goda of Racines (the importer) visited him last year before the Dive (the wine fair in Angers). The élevage surface cellar Brendan started his winery from nothing and he invests everything he earns now in tools. Thierry Puzelat was very helpful, selling him at low price a batch of casks as well as vats, which allowed him to start in better conditions. Brendan Tracey makes wine from the following varieties (usually 60-year-old vineyards) : Sauvignon, Pinot Noir, Gamay, Côt, Romorantin, Cabernet Franc and Pineau d'Aunis. The Cab Franc grapes are farmed in biodynamy by Bruno Allion in Thésée la Romaine. When he was still in the wine school, he bought his first batch of grapes to Bruno Allion to see if he could make wine (he made 400 liters of wine), so he is a long-time friend of his. Since that time Bruno keeps selling him these grapes year after year and he makes a rosé pet'nat with them (Pink Bull') after having been inspired by the work of Pascal Potaire's Piège à Filles, also a natural sparkling with residual sugar. He'd like to have also a parcel of Grolleau, he's looking for an opportunity. Sauvignon 2013 -- still fermenting __ We first taste the Sauvignon 2013, still turbid an fermenting. Was at 1002 3 days before. Parcel : les Hauts Bruyères, in Saint Julien de Chédon (along the Cher river). Brendan says that this year the wine should be lighter than other vintages because the blossoming was late, there was a lack of light plus more water at some point. Last year this sauvignon reached 13 % in alcohol, this year with the vintage it should be around 11 % or 11,5 %. Nice aromas of grapefruit, citrus. At the beginning he made wine from a mere 40 ares in this saint-Julien-de-Chédon but now he augmented his purchased fruit to 2 hectares there. Speaking of appellation and labels, Brendan says that all the grapes he purchases are on appellations but as he vinifies in a facility located outside the respective appelations' boundaries, he can't apply for any of these appellations, so his wines are labelled as table wine with the familiar blue seal cap on the top (pic on right). Today the Vin de Table term has been replaced with Vin de France, but anyway that's fine for him. Again, Brendan says his years as a punk-rock musician made him distrustful of the establishment rules and making wine under the table-wine label is just nice, he feels more free. What really counts for him, he says, is pick at the right maturity, sort the grapes properly and the best way to do all that is when you do it yourself. If he had the work done by the grower and the wine made at the grower's facility, he could apply for an appellation but he'd loose control on what really counts in the winemaking : the finetuned control of the grapes from just before the harvest to the chai. One more thing, Brendan designed most of his labels, and he studied art and design at the Beaux Arts in Orleans, which certainly helped. He says that it is important to have labels that say something, and also as he started without financial backings, doing the label-design job yourself saves money. The nascent Romorantin __ Romorantin 2013. Interesting nose. In the mouth, a real candy, it's stil very sugary, close to the grape juice. You can feel a nice fruit here he says, beyond the fact that it's very early to really appreciate. He waited as much as pôssible to pick these Romorantin grapes but the ripening was difficult in 2013 because the cold winter brought a later blossoming (by several weeks) and thus a later ripening. It's the 3rd year he's making a Romorantin wine, and he works from a parcel of 30 ares, he made three barrels this year. He doesn't stirr his whites, he just lets the wine by quiet, itself, adding after a pause that maybe he could try to stirr, like he did it at Puzelat. Brenda says that everything ferments well this year, compared with 2012 where he has some of the fermentations lagging until end of july (the cold winter also played a role). __ Romorantin 2012, in newer casks. Brendan says that he made a try with an élevage in newer casks (3 years old) to see what it yields. He bought the barrels from the Tonnellerie du Val de Loire, a cooperage not far from here in Mont-prés-Chambord. This company was actually a sawmill and it bought back the Tonnellerie Blanchard (which I visited a few years ago) after the owner Jacky Blanchard retired, rebranding it as Tonnellerie du Val de Loire. He'd like to make a 6-month élevage in wood for this Romorantin 2012 but his stock of 2011 is dwindling rapidly and he may have to bottle a cask before the term. In general he'd like to make longer élevage for his wines but he can't really at this early stage of his business, plus the demand is pushing the release earlier. He tries harder with the Romorantin as these whites are known to age very well. The wine has indeed some vanilla, even whisky notes at this stage. Tasting the Sauvignon 2013 __ Sauvignon Les Hauts Bruyères 2013. In a metal vat because there weren't wooden vessels enough for the volume of Sauvignon, but Brendan says that it is interesting too in a neutral vat like this one. He may separate the batches and make two cuvées, one that goes through barrels ansd the other through vats. The wine is more advanced in its fermentation, there's still a bit of sugar, it's still on its way. __ Pinot Noir, from a cask. Les Hauts Bruyères. Very light color, almost like a rosé, it's a direct press. Very turbid, stil fermenting (was at 1000 3 days before). He chose to make a direct press because of the condition of the grapes but the wine turns out well actually. For this one he had to put a bit of sulfur at homeopathic doses on the incoming grapes. Very nice if still early, you already find the elegant tannin of the pinot noir. __ Pinot Noir, also from a cask, made with a 10-day maceration, also from Les Hauts Bryères. The color is a bit darker but not that much compared with the former. More substance, the mouthfeel is more forward. 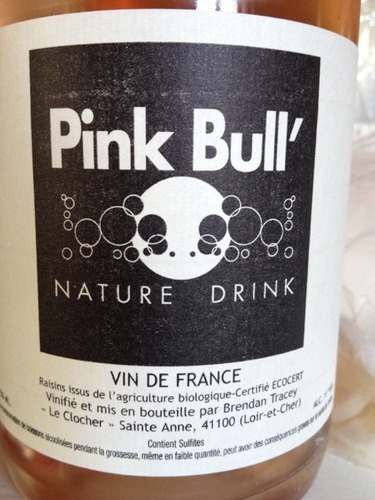 Tasting the future natural sparkling __ Pink Bull' 2013, the future pet'nat or natural sparkling made from cabernet franc. Brendan takes a sample from a big one-ton plastic vat near the barn door. Incredible color, vivid with velvety shades. From a vineyard making 20 ares. Very juice-like at this early stage, delicious candy. Brendan shows me at this point the label of Rouge, the first cuvée he made (and which he keeps making most years), it's a Gamay. The cuvée name is in two parts, first Rouge (Red) in red letters at the top, then on the lower part the sentence "Le Capitalisme Rouge est une Voie un Vin de Garage", a play of words with red capitalism (a slur for Trotskyists), dead-end way and garage wine... the picture of the man holding a glass on the label is a brother of a his grandfather (on his mother's side), an artist named Yves Tanguy who was friend of Jacques Prévert and Breton, took part to the surrealist movement and lived a bohemian life throughout the 30s' before settling in the United States around WW2 with his American wife. See here a page with lots of illustrations of Tanguy's Art. This label has also to do with his years when aged 13 in San Francisco he was flirting with the Troskyist dream, Rouge being the name of the Trotskyist newspaper in France then. The slogan on the lower part of the label happened to be one of the slogans used by the leftist newspaper. Last year he couldn't do the cuvée because the yields were so low, but in 2013 he bought some gamay to his friend in Saint Julien de Chédon to make the cuvée again. A vintage gravity filler Brendan bottles both with a service company that comes here with its truck, and a small vintage gravity filler lent to him by his friend Simonutti. It's Swiss made (probably from the 50s' or 60s') and it's known as the Rolls Royce of gravity fillers, it's making a very good job. He moved it on the table to show me it's pretty heavy but it feels secure like an American car of the 50s'... It's made by Elva, an old Swiss company with long record in the manufacture of winery tools I love these simple and efficient tools that last forever, take so little room and fulfill optimally their mission on the most discreet manner... Brendan says that Olivier Lemasson has the same gravity filler, this type of simple filler is particularly appreciated by natural-wine producers who like to bottle a barrel now and then when it pleases them (you don't call a bottling company for the next day, and certainly not for a small volume). __ Gorge Sèche 2012, 50 % Pineau d'Aunis, 25 % Côt and 25 % Gamay. 11 % in alcohol ! Asked if he tells about the varieties on the label, Brendan says that while it was theoriocally possible to display the varieties on a table-wine label, you had until recently to go through an administrative process and make a written demand for the authorization to FranceAgriMer (the French admistration dealing with sea & agriculture products), and this, before the grapes were even picked, at a stage when a winemaker doesn't know which cuvée he'll make. But recently, this administrative authorization has eased and you can ask for it two weeks before the bottling and commercialization of the wine, which is much more convenient, so Brendan will be able to print the variety on his table wines routinely. In the mouth, it's a pleasure, you drink this wine by itself, it's fruity and gentle, with enough of pineau d'aunis to make you feel all its lively character. A couple sips later, I'll note the candy, acidulous side of this wine, really enjoyable. Brendan says that he made a special cuvée of it for Coinstot Vino (the wine bar/restaurant in Paris_map), he walks to a cabinet behind where he stores his labels and sticks one on a bottle. Nice design, easy to spot with the color and the crossing lines. The label also reads Vin de France and this unusual 11 % in alcohol. Another vin de soif that should sell well at the wine bar... Filling a glass Brendan says that he asked for the authorization to print the variety for his table-wine cuvées of Romorantin and of Pinot Noir, and he'll also ask if he can exceptionally get a derogation for the pineau d'aunis so that he can also name the variety in spite of not having asked it before the harvest. __ Pour une Poignée e Bouteilles, Vin de France (Pinot Noir & Côt). The label (pic on right) is an humoristic reference to an iconic Western by Sergio Leone, with the would-be-Clint-Eastwood character in the foreground holding his hand ready to grasp a bottle. It's actually the only label which Brendan didn't design himself, even the Coinstot Vino label is his work, if inspired by the bar's logo. It was designed by a friend-caviste in Blois who is also a designer. [Edit] I'm just having a few glasses of this wine back home (picture on left) : very nice and pleasant drink, inspiring color and turbidity, makes you gently high and ask for more, and again I love this light color and haze... Try this wine if you see one, it's very alive. Brendan explained at this point how Coinstot Vino happened to ask for a special cuvée with one of his wines : he has been selling wine to them (they're two associates) for a while, and earlier this year Guillaume came to La Dive (the natural-wine event that takes place in Angers in late january) and Brendan had him tasted a few samples of wines thar were still fermenting in his barn, including the Pineau d'Aunis wine (actually he had brought a micro-blend because the wine is not 100 % pineau d'aunis). Guillaume liked it and made an order right away, and when Brendan bottled the wine before the harvest it was already sold out including with his Japanese importer. Brendan Tracey with two Spanish pickers (Le Briseau 2012) __ We finish with a bottle of Romorantin 2011 and some cheese, a good pairing before taking the road to Blois and then across the Sologne to the Cher valley further south. This Romorantin may be labelled as a vulgar table wine but it's naturally made, unfiltered and un-sulfured. In the mouth it is straight, neat with a nice roundness. I ask about the malolactic, Brendan always let them unfold. He listens to the fermentation bubbling noise and he says that the malolactic makes a very different, distinctive noise compared to the alcoholic fermentation. He made 4 casks of this Romorantin in 2011. Brendan still had 200 bottles left of the 2011 when this visit took place. Asked about the aging of bottles, wether he keeps bottles aside to see in a few years how they behave, he says yes, but just a dozen per cuvée because he hasn't enough volume, and he'll check for example this Romorantin and the 2010 as well to see how it ages. He keeps the wine in an old cellar under the house which dates from the 9th century. Brendan recounts me an incredible anecdote : When he came from California to France in 1971 as a teenager to eventually study in a high school in the Loire, he ended up being in the same class than Christian Chaussard in the Lycée Notre Dame des Aydes, a Catholic school of Blois (no public school accepted an American who didn't speak enough French...). Chaussard was in a scientific cursus in the school and Brendan (who says that he was not good in maths) was in the literary section. Their paths crossed again at the Wine fair of Villebarou in 2008 (north of Blois) where Chaussard was pouring his wines, Brendan had come to taste wines and he was surprised to see Chaussard, who in turn encouraged him to start-jump his new career in winemaking. And only later he leant that Chaussard was the president of the AVN, the natural-wine association... This is a strange coincidence, they had both followed their path not knowing about the other and ended up follwing the same work and philosophy. This year, two thirds of Brendan Tracey's wines were exported, first to Japan (Racines), to New York (Vitikult), Belgium (Biodyssey), Holland (Wilde Wijnen) and Denmark (Lieu-Dit). Otherwise you can find his wines in a string of cavistes in Paris : La Cave des Papilles (a street wine-shop that also sells and ships online including abroad), Coinstot Vino, Versant vins (she's alas moving to the Loire soon), Au Nouveau Nez, Crus et Découvertes, En Vrac (where you can buy wine in bulk). 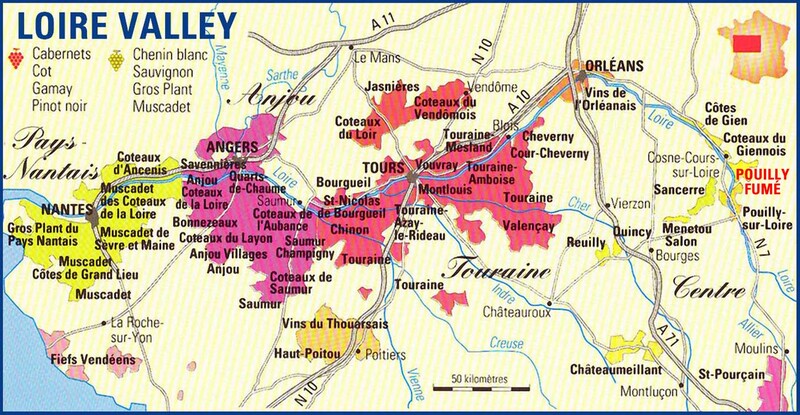 Brendan Tracey's wines sell for 10 or 12 € tax included in Paris. Thanks for this great article. As usual it is not only an interesting read, but also I learn a lot from clicking on the links you put in there. This type of article is my favourite - whilst I like the articles from Russia and Japan, it is the articles about the natural, artisan winemakers of the Loire and France in general that I like most. This article brightened my day. Thanks again.